Purpose: Use this document as a reference for how to run the AR Update process in batch in ctcLink. 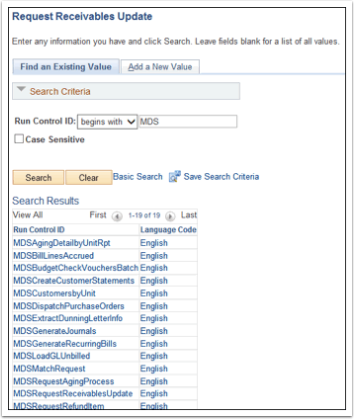 With the Find an Existing Value tab selected, enter search criteria for an appropriate Run Control ID. Select the Run Control you have previously configured for running AR Update. The Group Unit should be your district's business unit. The Process Frequency should be Always. The High Balance Basis Date should be Run Date. In the Accounting Date From and Accounting Date To fields, enter the dates you wish to process. Note: The Accounting Date To field will retain the last saved date which may NOT extend as far as required (usually the current or a future date). Select the PS/AR Receivables Update process and click OK.Note that any pending items with a Posting Action of Batch Standard will be posted to the appropriate customer accounts (are now open). Accounting will be written to the AR Subledger and later moved into the GL when the Journal Generate process next runs.